If you’re the type of person who loves to drink a smoothie then you definitely should know how to make them for yourself at home. Of course, it’s going to require you to have the right tools in order to get the job done right. The key is knowing what you actually need in order to find the right smoothie maker and we’re going to help you out with that. 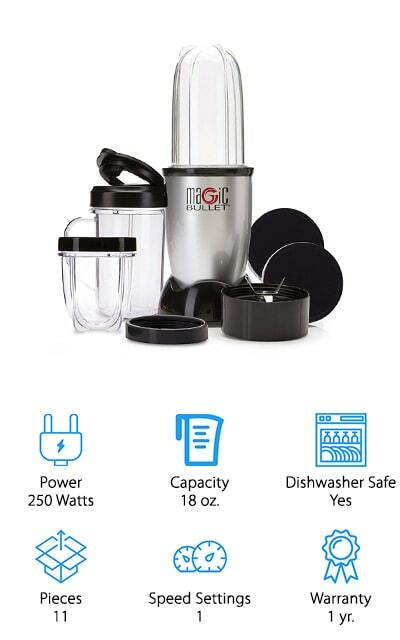 Before you know it, you’re going to know how to compare smoothie makers to make sure that you get the best rated smoothie maker out there. Power: How much power does the machine need in order to run? You want to make sure that you have the right amount of power available and that you’re not using up too much in order to get just a single small smoothie. Capacity: How many ounces are you going to get out of one session? If you drink a lot of smoothies in a day or at a time you want to make sure the smoothie maker you choose can get you a full serving at the same time. Dishwasher Safe: Can you put it in the dishwasher or are you going to have to spend a little more time and effort trying to clean things out when you’re done? This is personal preference but it’s definitely a time saver. Pieces: How many pieces are going to come in the box that you get? Are you going to have to put everything together yourself or does it come already assembled or at least partially? This is mostly just so you know. Speed Settings: Multiple speed settings can help you get the right consistency for your smoothie. This will depend on your personal preference and also the type of ingredients that you tend to put in your smoothies. Warranty: Does the company stand behind the product and offer a good length for the warranty? Are you going to have something that should last a long time or something you’re not completely sure about with a short warranty? There are plenty of different options out there for choosing a smoothie maker, but we’ve created a list of the top 10 smoothie makers so you can make an informed decision. After all, once you know the top ten smoothie makers you’ll be able to narrow down your list and make sure you’re getting something that works for what you need. 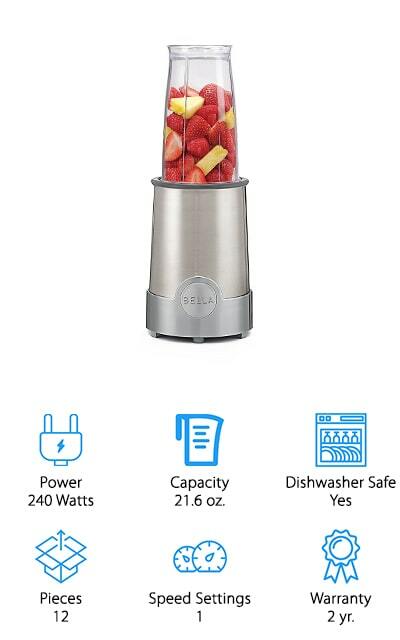 Our top pick is definitely the best smoothie maker for frozen fruit and it’s great for a number of other things as well. The 1100 watt base powers a 72 ounce pitcher, which makes for plenty of power and plenty of products as well. You’ll also have 2 16 ounce cups included that you can fill up with your frozen drinks, smoothies and whatever else you might want. There are 3 different speeds as well as pulse and single-serve functions. Pour in ice and you’ll have snow in just a few seconds, plus, when you’re done with everything you can put it right in the dishwasher. The parts are BPA free, and the pitcher has markers that let you know just how much you’re adding in every time you start to make a new drink. With easy to understand options and buttons, this is definitely going to be a simple process for you to get a great smoothie. If you’re looking for the best cheap smoothie maker then this is it. This Magic Bullet gives you 11 separate pieces, including several cups and lids to go along with the blender itself. 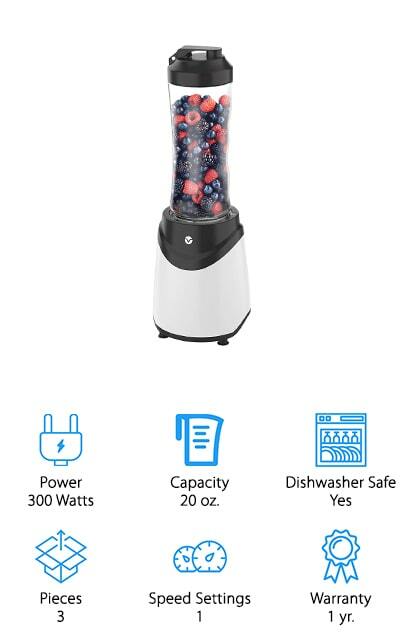 The 250 watt base means that you’ll be able to mix up just about anything you want and you can even whip or grind to get the perfect consistency for different treats, smoothies and a whole lot more. Included in the set is even a recipe book that helps you get some new ideas for what you should be doing with this blender. To improve your own personal design you can choose between silver, green and red blenders as well. The small size of this blender means that it’s great for smaller batches and that it’s easy to carry along with you. Simple to use, all you need to do is twist your cup onto the base and it’s going to be ready to go, just like that. 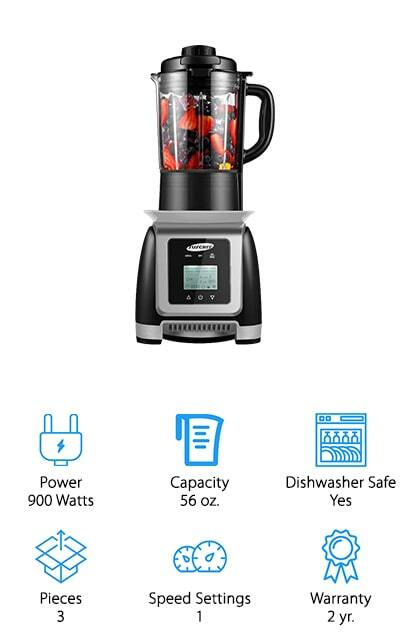 This inexpensive blender is one of our top smoothie makers for a number of reasons, but especially because it gives you 7 different speed settings and a brushed stainless steel and black finish. There are pre-programmed settings and manual settings that let you pulse ice easily. The 1000 watts of power and the dual direction blade technology control stainless steel blades for rust-free cutting. There’s a 10 year warranty on the metal drive and 3 year overall warranty that lets you know it’s going to last for a long time. The glass jar that comes along with it is dishwasher safe, which makes it easy to clean as well. The 2 ounce filler cap gives you markings and helps to pour and measure ingredients as you put them in. connecting pieces are made with metal instead of plastic and the whole thing is actually made right in North America. This is possibly the best small smoothie maker with 14 ounces of space in the blender jars. There’s a travel lid that lets you drink directly from the jar and because it’s a great size it fits into drink holders easily. Available in several different colors to fit your personal preference, all you need to do is push 1 button and you’re ready to go. In the set, you’re getting 2 jars, which means that you can mix up a drink for yourself and for someone else right after another and then take the jars with you when you head out on the go. The blender jars have absolutely no BPA and you can put the jars and lids directly into the dishwasher when you’re done for the day and the cord can be wrapped directly around the blender so it’s a whole lot easier to store away. The best personal smoothie maker is important, and this one is just what you’re looking for, with 13 pieces and a high speed option. With 900 watts of power, this system even gives you a hardcover recipe book, lids, lip rings and even a pocket nutritionist. Complete with a 1 year warranty, you’re also going to have stainless steel blades that use a cyclonic action to get the right amount of power. You’ll be able to create anything from smoothies and protein shakes to nut butters. Even tough fruits, vegetables, seeds and some of your favorite superfoods are no match for the blades on this thing. You’ll get fast prep times and a flip top lid that makes it super easy to take along with you wherever you want to go. Because it breaks down cell walls it also brings in even more vitamins and minerals while giving the entire drink a great texture. Check out this option to get the best smoothie maker, with plenty of options. It provides 1500 watts of power and gives you 6 different pre-programmed settings. You’ll get a 64 ounce jar that will hold plenty of your favorite beverage. It also has a pulse function that lets you get just the right consistency for you. 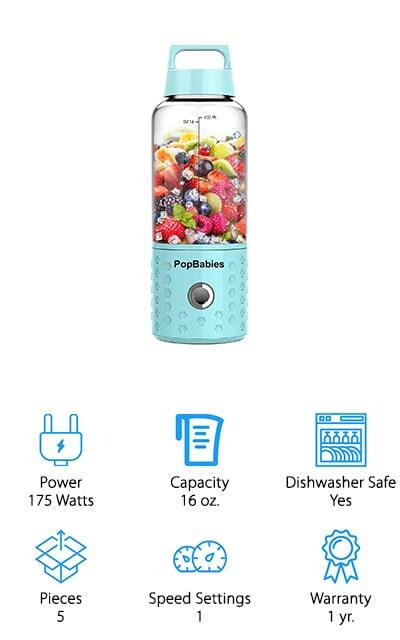 Completely BPA free and FDA approved, it’s made with high quality materials and is super easy to clean because you can just throw it in the dishwasher and you’ll be all set. The pitcher, the lid, lid plug and tamper and even user manual are included. The 2 extra non-slip feet are great for setting it up on your counter. 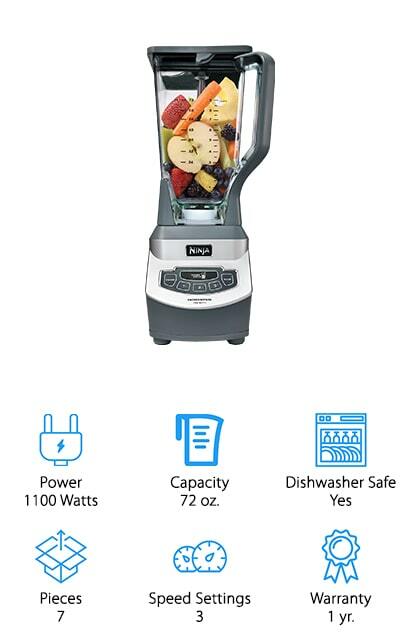 There’s an 18 month warranty on the blender itself and with it, you’ll be able to crush, blend, grind, puree and more. Create your favorite smoothies, juice, minces, baby food, sauces and even soy milk. All you need to do is put all the ingredients inside and choose the right setting for what you need. 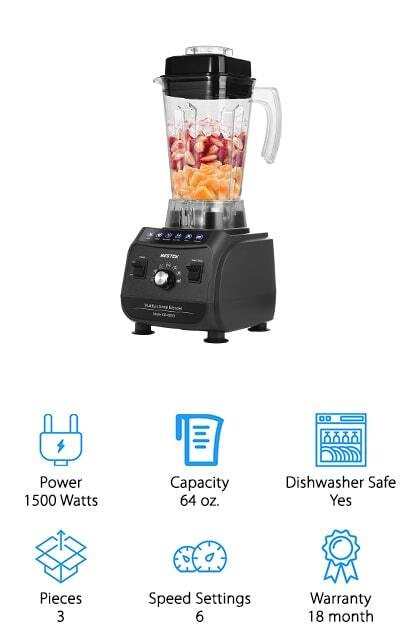 This blender is definitely unique and it actually charges with just a single USB, which means you can take it with you absolutely anywhere. 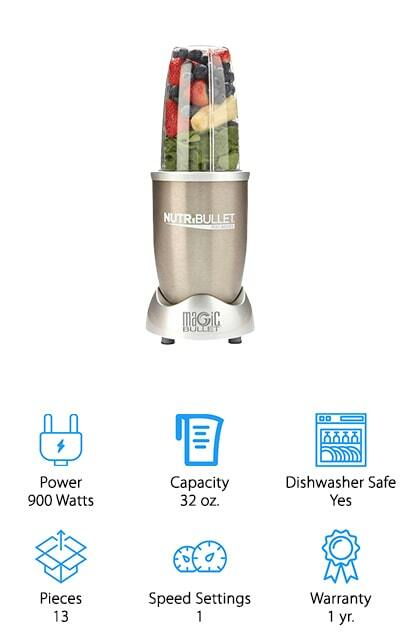 You can set it up with everything you need and when you’re ready just hit the button and it will create your smoothie. Included in the set is even an ice tray funnel, a recipe book and much more. Great for baby food and specially designed BPA free as well as rated for baby food, it’s a great option. It uses ice, frozen vegetables and fruit and even seeds to create a blended smoothie in as little as 20 seconds. You can blend and then drink immediately out of the same cup, which makes it even more convenient The blades are stainless steel and it holds up to 16 ounces with a 175 watt motor to give you just the right amount of power for anything. This blender provides a great option for single serve smoothies, shakes and a whole lot more. It’s actually heavy duty even despite the small size and it’s completely BPA free. At 20 ounces in total size, you can choose between black and white or red and white. The motor is 300 watts and has a full copper motor which provides enhanced airflow. You’ll get suction feet that make sure the blender is going to stick directly where you want it on the counter. All you have to do is lock the cup in to get started blending and the leak proof lid means that you’ll be able to flip the cup and take it with you. The lid makes sure the container cup has easy drinkability as well. Lightweight and with a sleek design, this is a great option for someone who wants simplicity. It’s even dishwasher safe so you can easily get it clean and put it away. 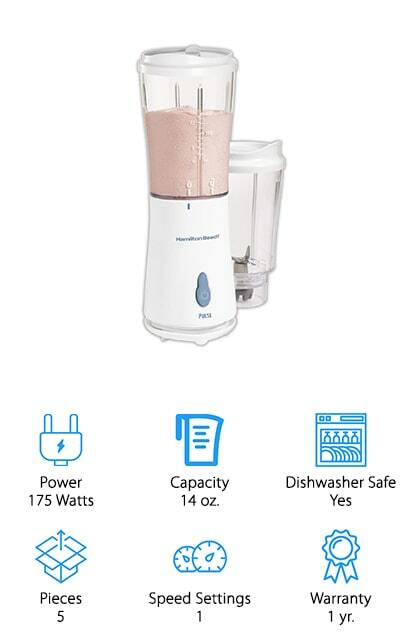 This super simple blender is actually made for just 1 person and comes with a 12 piece set so you’re ready for anything. It’s stainless steel in color and all you have to do is twist on the cup to get started. It can blend right through whole fruits, leafy greens and even dry foods or spices. The base has rubber feet that give you better grip and make sure that it will sit wherever you want it. The lids even let you take the cup on the go and drink it easily or let you shake it out onto your favorite foods. 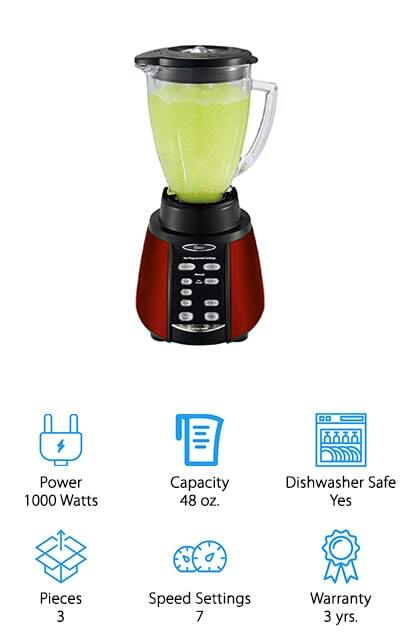 Everything in this blender is BPA free and dishwasher safe, including the tall blending cup, short blending cup, drinking cup, lids, comfort lip rings, shaker tops and more. Capable of doing just about anything you could want, this is definitely an all in one set. This blender is going to give you high speed and efficiency, capable of getting up to 35,000 RPMs. It also gives you all of the nutrition that comes from your fruits and vegetables and has 6 stainless steel blades to get through. Able to juice, create smoothies, soups and baby food or even grind meats, this is a very versatile blender. It’s made with completely BPA free materials and only works when the jar is installed properly to improve safety for those who are using it (or shouldn’t be). The 56 ounce pitcher is large and made with a heavy duty glass that’s actually stronger than plastic and better for you and your family. Complete with a 2 year warranty, this is a great option for you to get everything you need with the 900 watts of power.